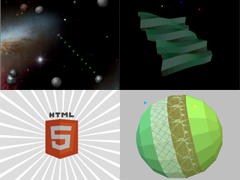 HTML5 Canvas demos, 3D graphics images and animations, Open Source Lightwave 3D object viewer and some oldskool dance music. Including Asteroids game demo, spinning HTML5 logo, 3D graphics demonstrations and some neat 1K demos that are under 1024 bytes. All the code can be viewed and some is packaged up ready for download if you want to see how they work or try it yourself! 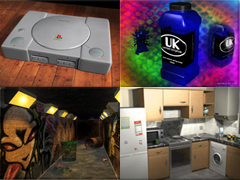 Gallery of images I have produced over the years using various 3D packages. If you don't want to view them all, this is probably the best example. I've been interested in computer generated 3D graphics for a long time. Real-time generated, computer game graphics, animations and photo-realistic rendering. 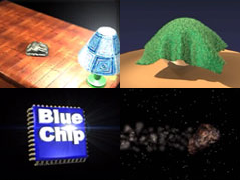 The galleries shown here contain a selection of renders created in several 3D programs since 1995. 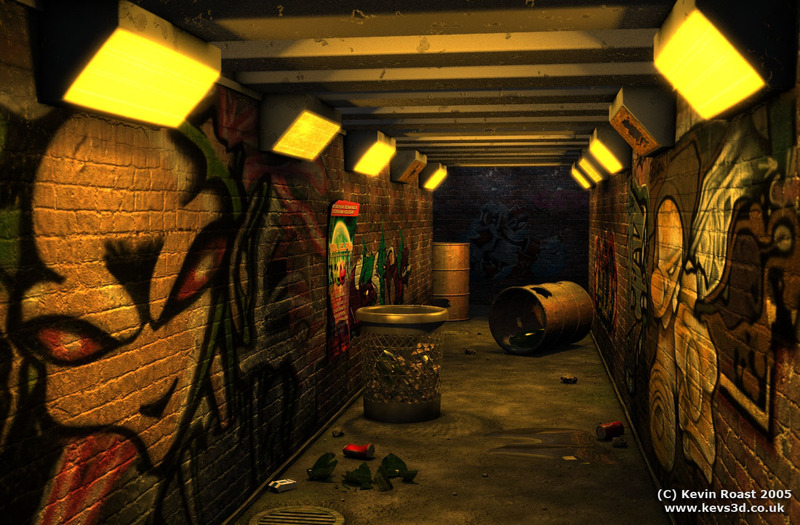 Most using Lightwave 3D. A few animations produced using Lightwave 3D. Some of these files are rather old though, so some codecs may be few and far between on modern PCs. 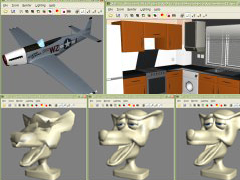 The K3D Lightwave object viewer is an open source project under the LGPL license. Written in .Net C# around the time I was experimenting with that language and a nifty little OpenGL wrapper called Tao that allowed full hardware accelerated 3D in .Net, without the horror of MS DirectX. I love it, all of it, even the mad stuff. 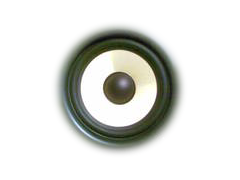 I have hundreds of hours of DJ mixes, CDs, live and studio mixes from 1988 to the present day. I've always enjoyed 'classic house' music from 1988-1995 but also love the modern style of dance music such as progressive house, breaks and dubstep. I'm not that great at it, but i've been writing tracks with various programs under the pseudonym of 'Shockwave' since 1995. The older tracks being faster, harder dance music. Learn how and where to play your favorite casino games online and 3D pokies at nzonlinepokies.co.nz. Casino Game Rules: Learn How to Play Classic Casino Games 3D slots toponlinecasinos.ca. Find the best 10 UK online Casinos, with free bonuses and casinos reviews https://best10casinosonline.co.uk/. Playing the best online slots real money is thrilling and exciting, however it is important to find reputable licensed USA online casinos. PlaySlots4RealMoney.com helps people that play slots for real money find safe and secure mobile gambling sites. Find out which Party code to use to play poker uk online. The new 2014 Party Poker bonus code gives players a $500 bonus in addition to cash rewards. 3D graphics have been put to good use in modern slot machines, as this page at vegasslots com reviews. The use of advanced animations and 3D design is most notable in the online gambling industry. The designers which work for some of the leading software providers in the industry like Net Entertainment, Quickspin and Yggdrasil Gaming create state of the art video slots with incredible visual details. These games are a real enjoyment to play and can produce great payouts along the way. If you want to see some of the latest and best slots in the industry check out new slot sites page. Here you can try the video slots for free or you can make and account at some of the online casinos and play for real money. 3D design is a very attractive profession and is used in pretty much every industry in the world. Lately we can see a big number of animated movies where everything is fully animated and simply takes your breath away when you see it on the big screen. Another industry where 3D animations are used on a daily basis is online gambling. The new video slots have state of the art 3D animations and exceptional visual details. If you want to learn more about the latest developments in this industry visit www.newcasinouk.com.